The most important thing that you can do for your investments is protect them; you would not buy an expensive tool and leave it out in the rain, you would put it in a tool box or shed. The same is true of horses for you farmers and ranchers; a good horse needs a home, steel barn horse stables from Coast to Coast can ensure that your horses will be taken care of during storms and other hard weather. Good steel barn horse stables also make it easier for you to take care of your horses, since you can feed and water them without having to be outside in the rain, snow, or killer heat of the summer time. 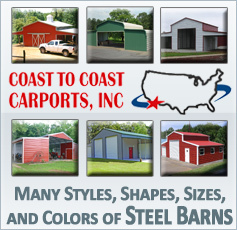 A lot of farmers feel that they can get by using a barn that they keep equipment or other livestock and crops in for their stables, but nothing can beat steel barn horse stables built by Coast to Coast. The number one reason why this is is because you can design the building that you buy at Coast to Coast. You have needs that must be met, and we understand that. You do not need just any horse stable, you need something that will do the job you need it to do, and that can be different for every person. Whether you have Clydesdales or Pintos, you need to be able to house them comfortably. And without being able to design your own stable, who is to say that you will get what you need? It is important to know that your stable will last as long as you need it to. 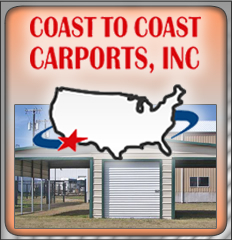 That is why every building at Coast to Coast with a 20 year warranty on rust through of framing on roofing material assuming normal user care and maintenance. A warranty like that is not available anywhere else on steel horse barns. With all this, why would you need to go somewhere else? Contact us today for your free quote.